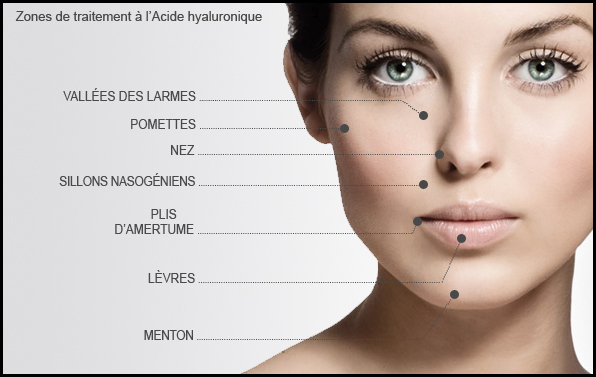 In Toulouse, Doctor Germain, aesthetic doctor, offers an effective approach against aging signs. Modern anti-aging techniques allow to obtain a lifting effect without having to resort to plastic surgery thanks to wrinkle fillers. Injections of hyaluronic acid, a natural component of the dermis, allow to rejuvenate the face by treating wrinkles, grooves, volume loss and sagging skin caused by aging. wrinkles: with loss of subcutaneous tissue, that first appear in the area of the nasolabial folds. For wrinkles and fine lines, we use, among other products, the hyaluronic acid, natural component of the dermis. Together with fat, it represents the major part of the face volume. But this natural “filler” has the tendency to disappear with age because the body produces less and less hyaluronic acid. The supplementation of this molecule can provide significant benefits both in terms of skin longevity and of skin quality. During the past years, hyaluronic acid became the star molecule in aesthetic medicine for wrinkle filling. It has a double efficient action: against the wrinkles and against the sagging of the low part of the face. The hyaluronic acid injected under the wrinkles is obtained through biosynthesis, of non-animal origin and almost identical to human hyaluronic acid. This biodegradable synthetic substance replaced collagen. It is hypoallergenic; therefore there is no need to undergo an allergy test beforehand. It is a transparent viscoelastic gel. The injected products can be biodegradable in progressive and complete cutaneous reduction; not biodegradable persisting in the skin during several years. The choice of the product is made according to the request but often also according to the habits and the experience of the practitioner. Today, the volumizing products are especially: the acid polylactique, the acid hyaluronique réticulé, the acrylamide... The use of the not degradable products remains more debatable because the balance profit-risk was not clearly established. It is essentially recommended for the low part of the face, mainly for the nasolabial folds, the bitterness folds, the area around the mouth, the cheekbones and the lips. Injected under a wrinkle, the hyaluronic acid plumps out the tissues and restores the smooth, natural and tight look of the skin. Hyaluronic acid attracts water and mixes with the hyaluronic acid already located in the dermis in order to restore its initial volume. Results: The hyaluronic acid allows an immediate treatment. A second injection after several weeks may be needed in order to stabilize and optimize the result. Wrinkle treatment through hyaluronic acid is generally easy; the results are visible immediately without leaving any scars. Noninvasive, it requires only little sick leave and it causes almost no discomfort. Restoring volume in cheeks and cheekbones is the most common intervention. The entire face can be treated: chin, temples and nose. We can also raise the eyebrows and redraw the face contour. Results: The purpose must be, above all, the general harmony of shapes and the natural look of the face. The results are particularly satisfying in mouth, cheeks and cheekbones reshaping. It lasts around 20 minutes. The product injected through a cannula, a needle with a round end that considerably reduces the risk of bruising. In order to obtain a good result, injections are done in depth. According to the area, an anesthetic cream can be prescribed before the session. For more comfort, hyaluronic acid used in the office contains anesthetic. Side effects are minimal: some redness, itching and swelling can appear. Rarely, granulomas can appear (small bumps under the skin) but they quickly disappear. The product is very well tolerated, except some contraindications, in the case of skin diseases. In most of the cases the only side effect is a light swelling. The depth of the injections can cause inflammatory reactions. This technique is contraindicated for pregnant or breastfeeding women and for patients under immunotherapy or with history of autoimmune diseases. How much time does the effect last? On average, the effect lasts 9 to 12 months. The performance depends on the type of skin, on the treated areas, on the quantities injected and on the injection techniques. In the lips, the hyaluronic acid lasts 6 months because of high vascularization. For restoring facial volume the effect lasts 12 to 18 months. One to three sessions spaced out of one to three months are necessary depending on the case. The prices of filling hyaluronic acid injections vary according to the treated area and the number of vials used. For more information please visit our prices page.